1 - Did the Court err in imposing sanctions? 2 - Did Judge Ott err in not reopening the case? 3 - Did the Attorney General have a conflict of interest? Did the Attorney General have a duty to present evidence opposing the Barnes paintings move? 4 -Did Judge Ott err in not granting standing pursuant to a Private Attorney General Theory? PA Attorney General’s Docketing Statement asking whether the Commonwealth is entitled to legal fees and costs, dated April 24, 2012. Judge Ott’s Memorandum Opinion Sur Order Assessing Counsel Fees, saying that the Attorney General’s Appeal for fees should be dismissed, dated May 11, 2012. Within a few months of the sudden death of Albert Barnes in 1951, the late Walter Annenberg began what would be a lifelong pursuit: to use the legal system to unravel the Indenture of Trust of Albert Barnes and unlock the treasured art collection of the Barnes Foundation. Today the quest continues, with Annenberg’s heirs -- doing business as the Annenberg Foundation -- joined by the Pew Charitable Trusts and the Lenfest Foundation, pressing on through the court for the treasured contents of the Barnes Foundation. Those efforts have been supported by many public officials, including numerous Attorneys General and Pennsylvania’s current governor, Edward. G. Rendell. The maneuverings reached a new level with the petitioning of Montgomery County Orphans’ Court by the Barnes Board to expand its number from 5 to 15 members and the request to move the art collection of the Barnes Foundation from Merion to Philadelphia. The stated reason for this decision was that the Barnes Foundation was so financially frail that its very existence was in jeopardy. The alliance of foundations – Annenberg, Pew, Lenfest – offered what was construed as the only solution -- financial “salvation” that containing a condition that spelled destruction of the Barnes Foundation: the galleries in Merion would be emptied and the contents shipped to Philadelphia. 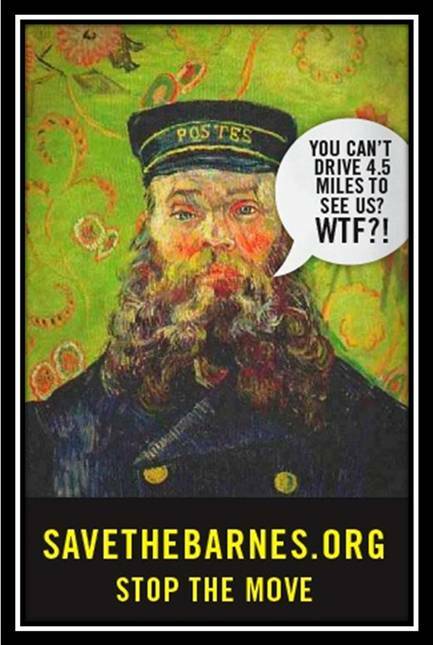 In December 2004, Judge Stanley Ott issued an opinion that grants permission for -- but does not mandate --the Barnes Board of Trustees to move Barnes’ art collection from Merion to a yet to be designed or built facility five miles away in Philadelphia. The decision was supported by Pennsylvania’s Attorney General, who abdicated his role as parens patriae for the beleaguered Barnes Foundation. The Office of the Attorney General continues to support the evisceration plan for the Barnes, despite evidence of changed circumstances for the Barnes Foundation presented by Friends of the Barnes Foundation in a detailed Memorandum. Public officials in Lower Merion Township have passed a Resolution calling for the plans to move the Barnes Foundation from Merion to be “forever abandoned.” Members of the Board of Commissioners of Montgomery County have also passed a Resolution embracing the Barnes Foundation in Merion, followed by a Request for Proposals to determine legal options available to oppose the planned move. In addition to the stated support of public officials, Resolutions passed by all local civic associations are unanimous against the move and in support of the value of the Barnes Foundation in Merion as the embodiment of a valued cultural heritage. Friends of the Barnes Foundation has developed specific alternatives to the destructive plan to move the art collection; alternatives that foster and protect the Barnes as an intact cultural treasure that is indivisible, unique, and irreplaceable. It is a Sensible Plan. The organization continues to work toward the goal of preservation of the Barnes Foundation in Merion. It is hoped that the materials presented here will help the reader understand the role of public officials in this developing story. 1) Governor Rendell pledged $25 million dollars as a contribution to the funds being pledged for the move of the Barnes art collection from Merion to Philadelphia. Research by FBF member, Gary Adler, revealed the source of that money: An appropriation in Pennsylvania Senate bill 1213 passed in 2002 granted $100 million toward “construction of a building for the Barnes museum in Philadelphia.” This bill was passed two years before the court ruling granting permission for the Barnes Board to move the collection to Philadelphia. Amazingly, none of the major parties in the court proceedings acknowledge having known of the appropriation, including the judge who eventually gave permission for the Board of Trustees to move the art collection. 2) According to an article in the Philadelphia Inquirer, “The Deal of the Art,” by Patricia Horn (May 22, 2005), $80 million in taxpayer money was pledged to Lincoln University, stewards of the Barnes Foundation, to motivate their Board of Trustees’ cooperation with the plan to move the Barnes from Merion to Philadelphia. • Governor Rendell pledged $25 million dollars as a contribution toward the move of the Barnes art collection from Merion to Philadelphia. Research by FBF member, Gary Adler, revealed the source of that money: An appropriation in Pennsylvania Senate bill 1213 passed in 2002 granted $100 million toward “construction of a building for the Barnes museum in Philadelphia.” This bill, proposed by Senators Fumo, Thompson, Jubilierer, and Mellow, was passed two years before the court ruling granting permission for the Barnes Board to move the collection to Philadelphia. Amazingly, none of the major parties in the court proceedings acknowledge having known of the appropriation. • Other interesting background information:: According to an article in the Philadelphia Inquirer, “The Deal of the Art,” by Patricia Horn (May 22, 2005), $80 million in taxpayer money was pledged to Lincoln University, stewards of the Barnes Foundation, to motivate their Board of Trustees’ cooperation with the plan to move the Barnes from Merion to Philadelphia. From December 2003 Hearings: The Testimony of Rebecca Rimel, CEO of Pew Charitable Trusts See also: Excerpt of testimony in which Rebecca Rimel states that she is “not familiar” with the Barnes Foundation Indenture of Trust. • On January 18, 2007, the Montgomery County Commissioners approved a resolution that plans to move the Barnes Foundation from Merion should be abandoned and that the Barnes Foundation Board of Trustees should explore avenues to integrate visitation into the Philadelphia tourist experience without relocating the Barnes. • In August of 2006 the Lower Merion Board of Commissioners unanimously approved a resolution stating that the plan to move the Barnes Foundation should be “forever abandoned”. Representative Gerlach has proposed a legislative initiative that imposes severe penalties on charitable organizations that work against donor intent. • The Merion Civic Association and the Federation of Civic Organizations have passed resolutions in favor of the Barnes Foundation remaining in Merion.